ATLANTA— State Representatives Allen Peake (R-Macon) today pre-filed legislation that would allow for the use and production of medical cannabis in Georgia. 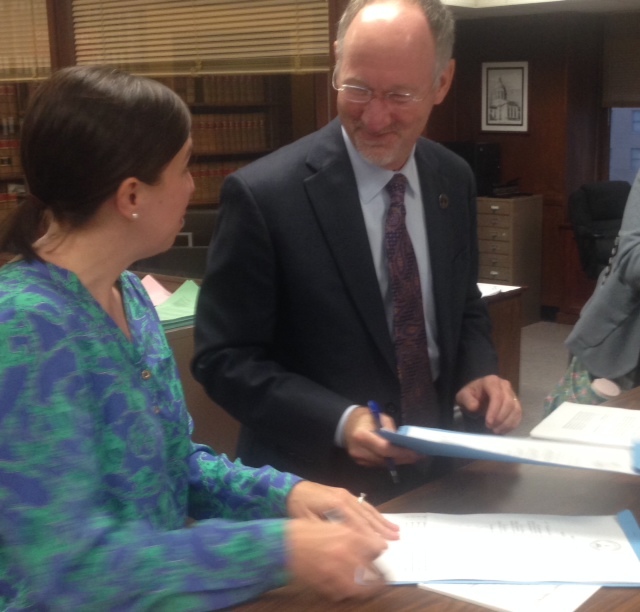 Rep. Peake’s legislation will be assigned as House Bill 1 for the 2015 legislative session. House Bill 1, The Haleigh’s Hope Act, will be formally introduced during the 2015 legislative session and would provide for the regulated use of medical cannabis to treat certain medical conditions. The bill would only allow for the use of non-smoking medical cannabis, in the form of liquid, pill, or injection, and the bill explicitly states that the intent is not to legalize the use of cannabis for recreational purposes. Under HB 1, only certain, registered patients would have access to the treatment, and it would only be dispensed by licensed, registered entities within the state. HB 1 would provide for a safe, effective, timely, tightly regulated, and secure infrastructure with strict state oversight for medical cannabis, which would contain a very low amount of tetrahydrocannabinol (THC). Additionally, the bill would decriminalize the possession of medical cannabis oil in Georgia for those patients who legally obtained the medicine in another state. Lastly, the bill states that the General Assembly would create a strict regulatory system around the medicine’s production that satisfies the recommendations of the U.S. Justice Department. During the 2014 legislative session, Rep. Peake authored and introduced House Bill 885. The bill was designed to increase treatment options for children suffering from seizure disorders, and other specific medical conditions, by restricting and regulating the distribution of cannabidiol, an oil-based derivative of the cannabis plant. HB 885 failed to pass during the 2014 session, but led to the creation of the Prescription of Medical Cannabis for Serious Medical Conditions Joint Study Committee, ultimately created by SR 981. The committee has held several meetings to hear from families who are seeking this treatment, in addition to law enforcement officials, the medical community, and leaders from other states with similar legislation. Representative Allen Peake represents the citizens of District 141, which includes portions of Bibb and Monroe counties. He was elected into the House of Representatives in 2006, and currently serves as the Secretary and Treasurer of the House Majority Caucus, the Vice Chairman of the Ways & Means Committee, and the Ex-Officio of the Appropriations Committee. He also serves on the Health & Human Services, Rules, and Small Business Development committees. For comments or questions, you may contact Representative Peake at rmsceo61@gmail.com, or 404-656-5025.